In a historical season for the Bemidji State men’s basketball team and senior forward James Ellisor, it is hard to believe that an award would come as a surprise. But on Tuesday Ellisor was announced Daktronics Division II Men’s Basketball Ron Lenz National Player of the Year and Daktronics First team All-America. The All-American selection was expected as a possibility for Ellisor, but the player of the year award surprised nearly everyone at BSU. With the award, Ellisor is the first player in BSU’s 90 year history to earn National Player of the Year. 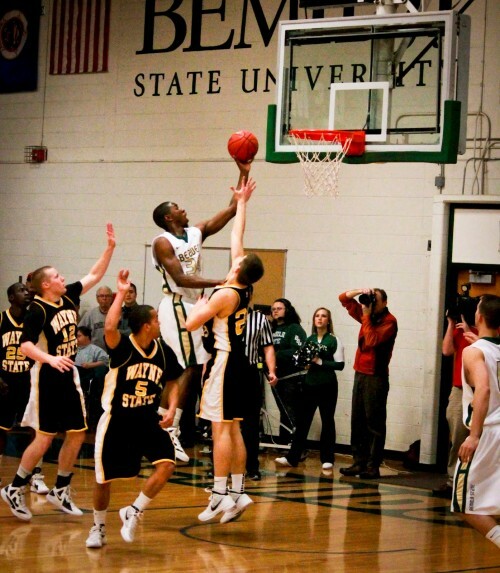 He is also just the third NSIC player to win the award in the last 17 years. The season has been an award-filled one for the senior forward; he has also earned Daktronics Central Region Player of the Year, Daktronics First Team All-Central Region, NABC Coaches’ Division II All-Central District First Team, NSIC Player of the Year, First Team All-NSIC and was a four-time NSIC Player of the Week. He scored a conference-leading 22.9 points/game and a total of 680 points which set the school record for points in a season. Ellisor scored at least 20 points in 18 of the 31 games this season and led the conference in three-point shooting at 57.8 percent. His 33.9 minutes, 59 percent field goal shooting, 87.7 free-throw shooting, and six rebounds per game all ranked in the top-ten in the NSIC. In just two seasons at BSU, Ellisor scored 1,129 points to rank 13th on the school’s all-time scoring list.